Tiësto recently announced the return of “Tiësto's Club Life College Invasion Tour,” the largest dance music tour to ever hit the American college market. Tiësto will headline the tour this autumn/fall with stops at campuses across the United States. 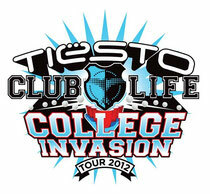 In 2011, Tiësto's “Club Life College Invasion Tour” made waves nationally for being the first tour of its kind to specifically target college markets. The tour, which visited 18 college markets across the USA and Canada was a phenomenal success and opened the door for college-focused tours from other big name DJs. The tour culminated with Tiësto’s sold-out record breaking performance at the 26,000 seat Home Depot Center in Los Angeles. The 2012 instalment of “Tiësto's Club Life College Invasion Tour” commences on October 2 in Syracuse, NY and winds its way through the Northeast and Midwest before hitting the South West and West Coast markets at the end of October. In addition to seeing him perform in their own college campus, fans will be able to interact with Tiësto in ways they’ve never been able to before. Several unique competitions will be held in each market giving college students the chance to be actively involved with the tour. More details to follow soon. Presale tickets are now available for Tiësto's InTheBooth.com fan club members. Further details about the tour, contests, additional promotions and tour dates will be announced in the coming weeks on the Tiësto University dedicated platform.